This is the all time classic coin trickclimax. There have been hundreds of routines published with a jumbo coin This coin is three inches (9 cm) in diameter and gives a big finish to any trick with half dollars. On the street or in the pub your spectators have never seen such a big coin and the impact on them is amazing. At the end of any coin trick it brings an instant round of applause. It tells the audience clearly the trick is over and its time to show their appreciation of your obvious skill. This coin is metal and makes a great ringing noise when dropped on the table. It loads easily into the sleeve for production. This coin has been nickel plated and will stay shiny for twenty or thirty years. It does not tarnish to a dull grey colour like most jumbo coins. Customers have come back and told me that the coin they bought fifteen years ago is still shiny. Because it is not a good idea to drill a plated coin it comes with a small hole predrilled in case you need to attach it to your belt with cotton for an easy steal or to use on a pull. The picture above shows a real kennedy half dollar alongside the jumbo one. 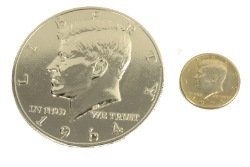 We now have this item as an Eisenhower dollar coin as well. So if you do your coin magic with Eisenhower dollars you can have a matching jumbo coin at the same great price as a Kennedy half.